Ranjit G. Singh is a PhD candidate in Public law at Sorbonne Law School, Université Paris 1 Panthéon Sorbonne. His research are related to issues of ICT Law, Data Privacy Law and development of Digital Public Administration, both in France and India. He obtained his Licence en Droit and holds a Master of Law degree in Corporate Law and Digital Law from Sorbonne Law School. 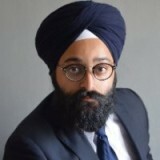 He is also an active member of Conseil Représentatif des Sikhs de France, which is representing the French Sikhs Issues with the French Authorities and French Governement.